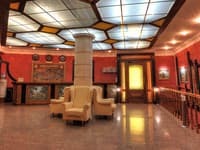 The hotel is designed by the famous author's project in Kiev, and opened in 2010. "Seventh Heaven" has nine rooms, which correspond to European standards, and include double-style rooms and luxury half delux, family rooms and standard rooms designed for 1 and 2 people. There are rooms for both smokers and non-smoking guests. 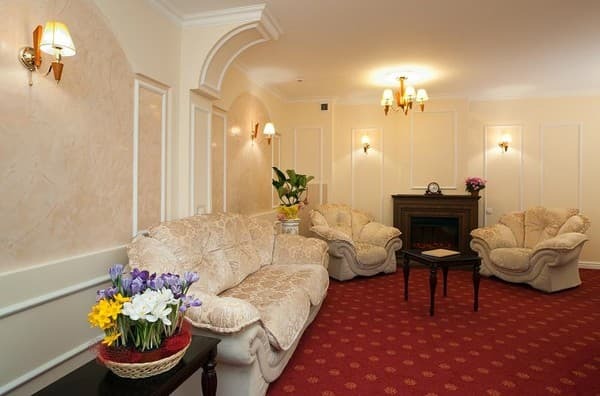 At the guests` attention we have a continental breakfast, the price is included in the room. Near the hotel there is a 24-hour parking-lot for cars. Description of the room: Room area of 26 square metres with a balcony. 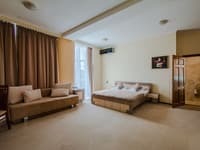 A bed (2,0м*2,4 metres) with an orthopedic mattress, antiallergic textiles, plasma TV, conditioner, a refrigerator, safe, an electric teapot, ware. In a bathroom - a terry dressing gown, the hair dryer, slippers, single cosmetics. A possibility of full blackout of rooms in the daytime. 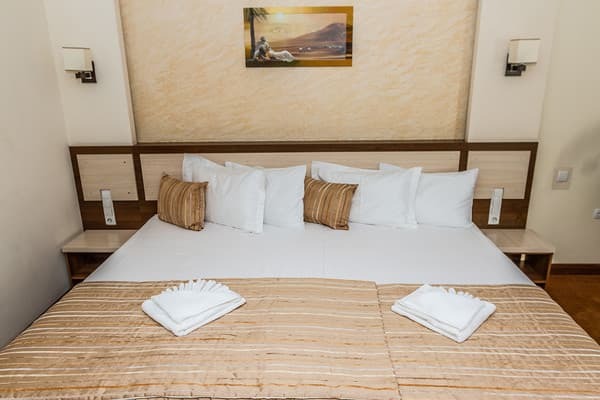 Description of the room: The spacious rooms have wide beds with orthopedic mattresses, anti-allergic textiles, plasma TV, air conditioning, refrigerator, safe, electric kettle, crockery. In the bathroom - hair dryer, slippers, single make-up. It is possible to completely dim out the rooms during daylight hours. Description of the room: The spacious rooms up to 21 sq. M. Have plasma TV, a wide double bed (2.0m * 2.4m) with orthopedic mattress, anti-allergic textiles, air conditioning, refrigerator, safe, electric kettle, crockery. In the bathroom - hairdryer, slippers, single make-up. It is possible to completely dim out the rooms during daylight hours. As an extra place we offer o comfortable folding bed. 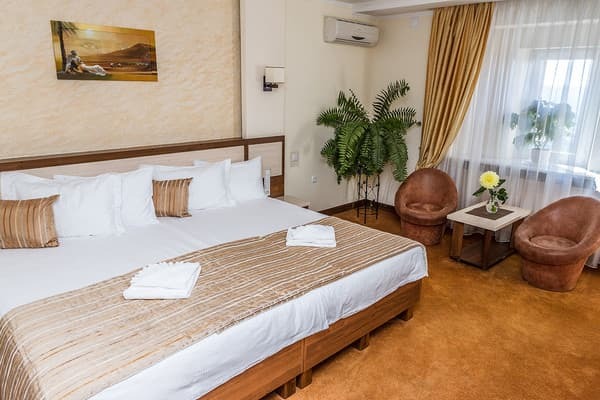 Hotel "Seventh Heaven" is situated in a picturesque place opposite Solomensky Park and downhilllowering "Protasov Yar" on the 16th floor of the house with a panoramic view. 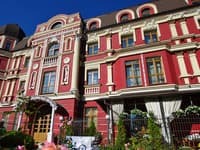 Not far there is a fitness centre, business-centre, National Institute of Cardiovascular Surgery named after N.M. Amosov, National Institute of Pulmonology and phthisiology named after F.G.Yanovsky. Already in 20 minutes after leaving the hotel its visitors are able to see the most beautiful historic and cultural places of Kyiv. it is very comfortable to drive to the hotel from the railway station by fixed-route taxi №198, which goes from the railway station square. 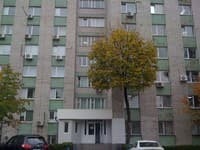 You should go out at the penultimate station "Protasov Yar". From the underground stations "Lybidska", "Druzhby narodov", "Dvorets Ukraine" there is a fixed-route taxi №450, go out at the station "Protasov Yar".